Manaslu Trekking Region is another most popular trekking destinations in Nepal. Mt. Manaslu (8,163 m.) is the eighth highest peaks in the world, located at Nepal and Tibet border. The trekking to Manaslu area was opened in 1992 for outsiders primarily for trekking and any other sorts of tourism activities. Since then, the trekking to this region has been popular significantly for having incredible scenes of the unique landscapes, natural wonders of snow-capped and rocky hills, have awesome views of range of mountains located in the Manaslu region. The term Manaslu means the spirit mountain which stands to be benevolent and strong deity in the local dialect. Because of this belief, this region trekking is regarded to be one of the restricted area trekking. You need to seek the permission in order you to have trekking to this area. Manaslu trekking region offers a range of awesome views of the majestic mountains, along the trekking trail you will have an opportunity to explore blend of culture, unique rituals, and lifestyles of diverse ethnic groups living along the trail, pass through the snow-capped peaks, glaciers, these are self-explanatory, why Manaslu trekking region is the loved and demanded trekking. Manaslu trekking region has two difference trekking area it calls Manaslu Larke pass Trekking and trans Himalayan valley of restricted trekking area Tsum Valley Trekking. 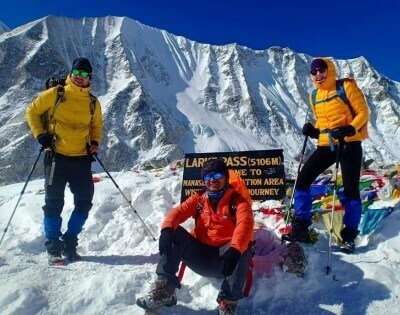 Besides having trekking to the highest mountain, you can also have expedition trip to this mountain, if not you can have climbing trips to the small rocks and snow-capped peaks, pass through glacier and prepare yourself for having expedition once in life time. These are explicit enough how adventure trip it is in the Manaslu region. Manaslu trekking region begins with a short rive from Kathmandu to Gorkha and then the trail continues through the picturesque valley and alongside of Larke pass (5420 m) and it finally takes you to Mt. Manaslu area and after having a complete excursion all around, the trail takes you back along the Annapurna classic trekking routes to Besishahar and then you will catch a private or public bus and return back to Kathmandu.